Crusty bread stuffed with mozzarella cheese then brushed with garlicky butter and topped with a pinch of crushed red pepper. 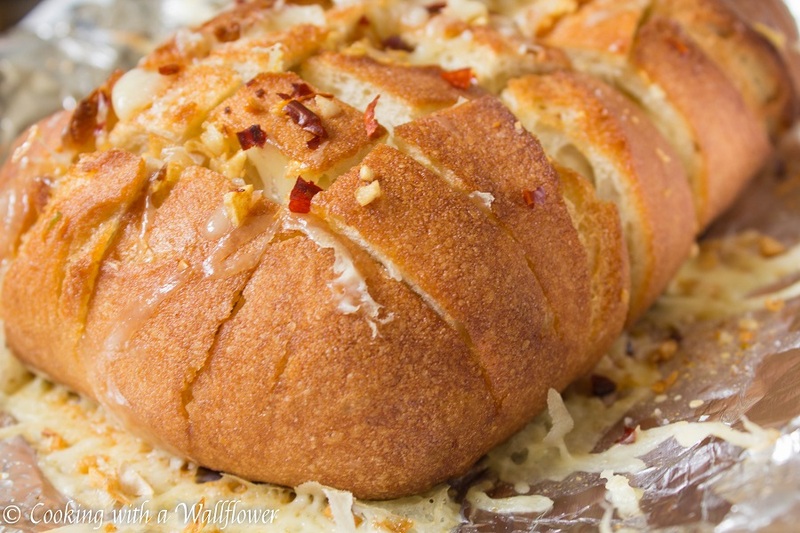 This spicy cheesy garlic pull apart bread is delicious and super easy to make. Um, have I mentioned that I might be addicted to bread? Give me a warm loaf of bread fresh out of the oven and I can probably sit there and devour it all on my own. I don’t need cheese or butter or balsamic vinegar or olive oil. But, you know, it doesn’t hurt to add all those extras to bread, right? 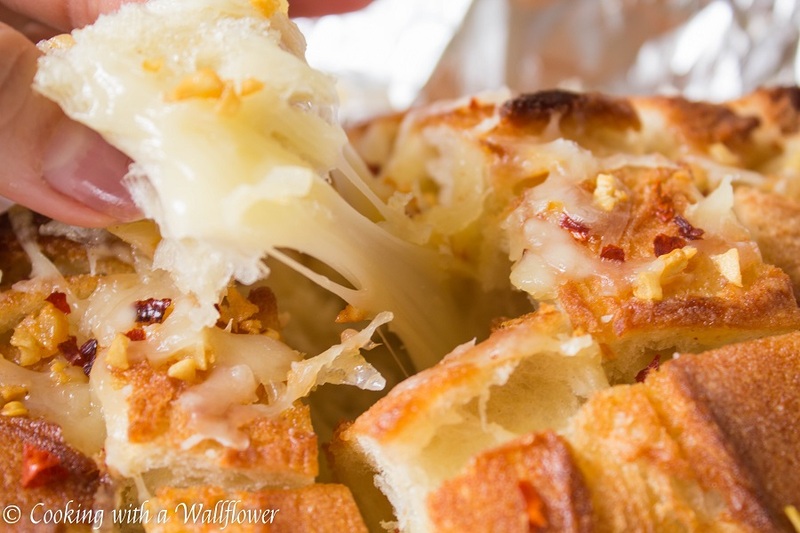 I don’t know why it took me this long to share with you this deliciously cheesy garlic bread, but it’s about time. Because when it’s this easy and this delicious, you know it has to be shared. For this bread, I actually didn’t use an entire loaf. Mostly because I wanted several slices in the middle for sandwiches and other things, but you can totally use the entire loaf for this spicy cheesy garlic bread. Make vertical cuts and horizontal cuts, about an inch or so apart, into the bread using a serrated knife. Stuff shredded mozzarella cheese into all of the crevices of the bread. The more cheese you get into the bread, the more bread pieces will be covered in melted cheese. Cook minced garlic in butter until it’s golden brown and aromatic. Brush this mixture of garlic and butter over the bread and add the garlic into the crevices. Sprinkle crushed red peppers over the top of the loaf of bread. 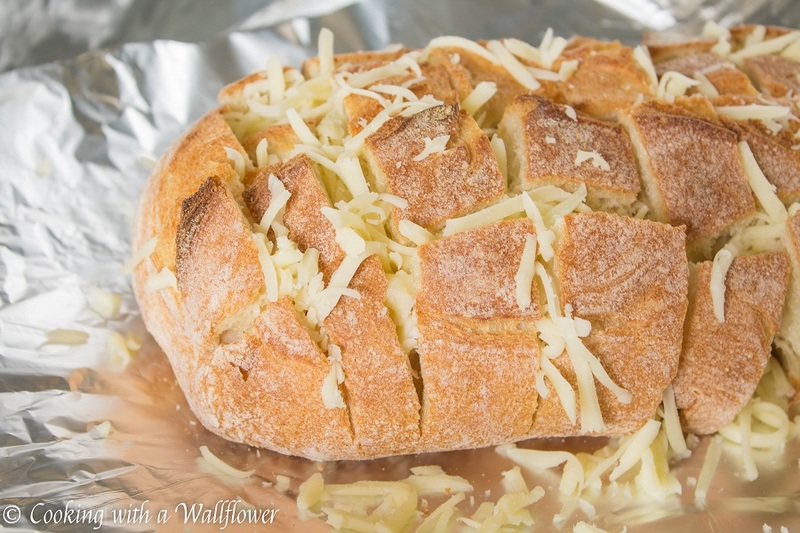 Wrap the bread in foil, place on a baking sheet, and bake the bread until all of the cheese has melted. 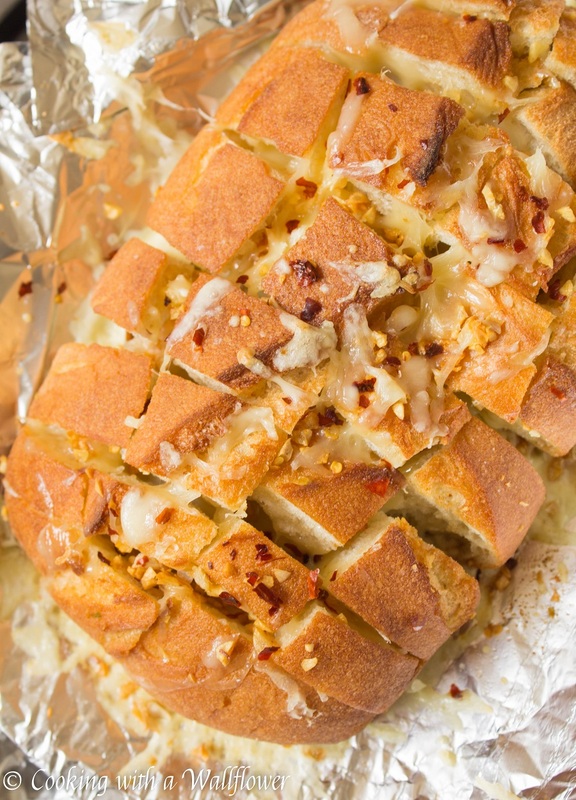 Serve the spicy cheesy garlic pull apart immediately. Find the full recipe for the spicy cheesy garlic pull apart bread over at Ask Anna where I contribute recipes every month. For a cheesy garlic pull apart bread made from scratch, you can check out the recipe from an old post back in 2014. Forever ago! This entry was posted in Appetizers, Bread, Quick and Easy, Recipes, Sides, Vegetarian and tagged appetizers, bread, quick and easy, snack, vegetarian. Oh wow. Giving this a try for sure! Oh, this looks good! Have added it to my BAKING folder. Definitely TO TRY!! I share your addiction and try to avoid the temptation as much as possible. I’d had a hard time passing on this. Oh my! This looks fabulous! Just showed it to my daughter – everything she loves, all in one place! Oh yum! This sounds like perfect comfort food. Thanks, Lisa! Have a great weekend!